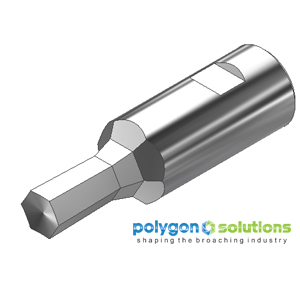 Polygon’s standard 9/64” hexagon rotary broaches are Made in the USA by Polygon Solutions Inc. for inventive machinists in home workshop, prototype and other non-production settings. Basic rotary broach cutting tools are made from high quality M-2 high speed steel with a practical +/-.001″ across flat form tolerance that meet the ASME B18.3-2003 standard for Hexagon Sockets. The broaches feature a .500” shank diameter and 1.75” overall length to fit the most common brands of rotary broach tool holders. The rake angle and depth of cut make Polygon's broaches the perfect choice for machining small blind and through holes. SKU: H0142B. Categories: 1/2" Shanks, Basic Hex Rotary Broaches. Tag: Basic Hex Rotary Broach.